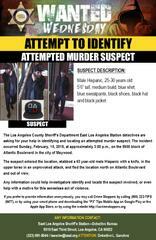 The Los Angeles County Sheriff’s Department East Los Angeles Station detectives are seeking the public’s assistance in identifying and locating an attempted murder suspect. The incident occurred Sunday, February 10, 2019, at approximately 3:00 p.m., on the 5900 block of Atlantic Boulevard in the city of Maywood. The suspect entered the location and stabbed a 63 year-old male Hispanic with a knife in the upper torso in an unprovoked attack. 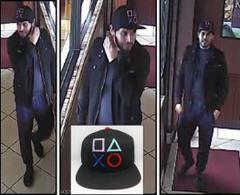 The suspect is described as a male Hispanic, 25-30 years-old, 5’6” in height with a beard. He was wearing a black jacket, blue shirt, blue sweatpants, black shoes and a black hat similar to the one seen in the picture. The suspect was last seen on foot, heading north on Atlantic Boulevard and out of view. The victim was immediately transported to a local hospital where he was treated for his injuries and is expected to survive. Anyone with information about this incident is encouraged to contact the Los Angeles County Sheriff's Department East Los Angeles Station, Detective Sanchez at (323) 264-4451.